Exception shipments are those that had an unforeseen event that may delay the delivery of your package. 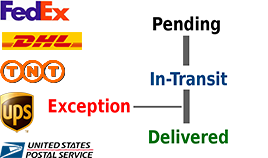 Exceptions can require additional information in order to be delivered. Examples include incorrect address, weather, damaged, missing, refused delivery, and no signature. We provide a multi-user, security level access to our Web Portal to view all exception shipments along with detailed reporting on status, results, and attention required items. Know about exception shipments and correct them where possible to avoid delays. Exception shipments that require user attention such as with an incorrect address can be updated by clicking the tracking number and selecting the appropriate action item. Our Support Staff will work with the carrier(s) to insure the exception has been taken care of. Very Simple. Very Easy. Start Today! Existing clients can get more information or activate this solution within our Web Portal or by reaching out to your Account Representative. Discounts are provided for clients of Ship Watchers that are already part of our auditing solution. If you are interested in learning more about how Ship Watchers can help you out with exception shipments, please contact us at any time.